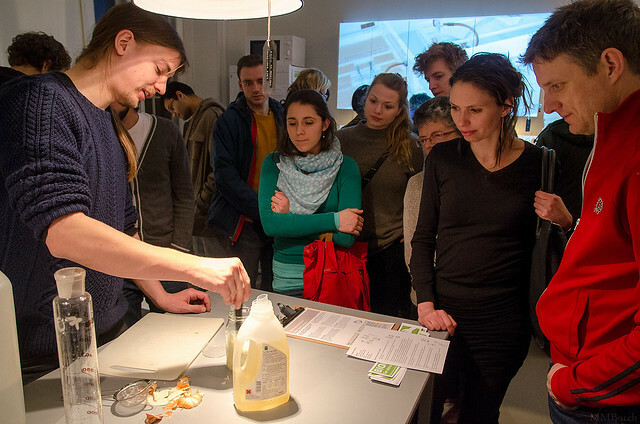 A biohackerspace is a community laboratory that is open to the public where people are encouraged to learn about and experiment with biotechnology. Like a makerspace, a biohackerspace provides people with tools that are usually not available at home. A makerspace offers making and machining tools such as a 3D printer, a CNC (computer numerically controlled) milling machine, a vinyl cutter, and a laser cutter. A biohackerspace, however, contains tools such as microscopes, Petri dishes, freezers, and PCR (Polymerase Chain Reaction) machines, which are often found in a wet lab setting. Some of these tools are unfamiliar to many. For example, a PCR machine amplifies a segment of DNA and creates many copies of a particular DNA sequence. A CNC milling machine carves, cuts, and drills materials such as wood, hard plastic, and metal according to the design entered into a computer. Both a makerspace and a biohackerspace provide access to these tools to individuals, which are usually cost-prohibitive to own. Genspace in Brooklyn (http://genspace.org/) is the first biohackerspace in the United States founded in 2010 by molecular biologist Ellen Jorgenson. Since then, more biohackerspaces have opened, such as BUGSS (Baltimore Underground Science Space, http://www.bugssonline.org/) in Baltimore, MD, BioLogik Labs (https://www.facebook.com/BiologikLabs) in Norfolk, VA, BioCurious in Sunnyvale, CA, Berkeley BioLabs (http://berkeleybiolabs.com/) in Berkeley, CA, Biotech and Beyond (http://biotechnbeyond.com/) in San Diego, CA, and BioHive (http://www.biohive.net/) in Seattle, WA. What Do people Do in a Biohackerpsace? Just as people in a makerspace work with computer code, electronics, plastic, and other materials for DYI-manufacturing, people in a biohackerspace tinker with bacteria, cells, and DNA. A biohackersapce allows people to tinker with and make biological things outside of the institutional biology lab setting. They can try activities such as splicing DNA or reprogramming bacteria.1 The projects that people pursue in a biohackerspace vary ranging from making bacteria that glow in the dark to identifying the neighbor who fails to pick up after his or her dog. Surprisingly enough, these are not as difficult or complicate as we imagine.2 Injecting a luminescent gene into bacteria can yield the bacteria that glow in the dark. Comparing DNA collected from various samples of dog excrement and finding a match can lead to identifying the guilty neighbor’s dog.3 Other possible projects at a biohackerspace include finding out if an organic food item from a supermarket is indeed organic, creating bacteria that will decompose plastic, checking if a certain risky gene is present in your body. An investigational journalist may use her or his biohacking skills to verify certain evidence. An environmentalist can measure the pollution level of her neighborhood and find out if a particular pollutant exceeds the legal limit. Why Is a Biohackerpsace Important? A biohackerspace democratizes access to biotechnology equipment and space and enables users to share their findings. In this regard, a biohakerspace is comparable to the open-source movement in computer programming. Both allow people to solve the problems that matter to them. Instead of pursing a scientific breakthrough, biohackers look for solutions to the problems that are small but important. By contrast, large institutions, such as big pharmaceutical companies, may not necessarily pursue solutions to such problems if those solutions are not sufficiently profitable. For example, China experienced a major food safety incident in 2008 involving melamine-contaminated milk and infant formula. It costs thousands of dollars to test milk for the presence of melamine in a lab. After reading about the incident, Meredith Patterson, a notable biohacker who advocates citizen science, started working on an alternative test, which will cost only a dollar and can be done in a home kitchen.4 To solve the problem, she planned to splice a glow-in-the-dark jellyfish gene into the bacteria that turns milk into yogurt and then add a biochemical sensor that detects melamine, all in her dining room. If the milk turns green when combined with this mixture, that milk contains melamine. The DIYbio movement refers to the new trend of individuals and communities studying molecular and synthetic biology and biotechnology without being formally affiliated with an academic or corporate institution.5 DIYbio enthusiasts pursue most of their projects as a hobby. Some of those projects, however, hold the potential to solve serious global problems. One example is the inexpensive melamine test in a milk that we have seen above. Biopunk, a book by Marcus Wohlsen, also describes another DIYbio approach to develop an affordable handheld thermal cycler that rapidly replicates DNA as an inexpensive diagnostics for the developing world.6 Used in conjunction with a DNA-reading chip and a few vials containing primers for a variety of disease, this device called ‘LavaAmp’ can quickly identify diseases that break out in remote rural areas. How Can Libraries Be Involved? While not all librarians agree that a makerspace is an endeavor suitable for a library, more libraries have been creating a makerspace and offering makerspace-related programs for their patrons in recent years. Maker programs support hands-on learning in the STEAM education and foster creative and innovative thinking through tinkering and prototyping activities. They also introduce new skills to students and the public for whom the opportunities to learn about those things are still rare. Those new skills – 3D modeling, 3D printing, and computer programming – enrich students’ learning experience, provide new teaching tools for instructors, and help adults to find employment or start their own businesses. Those skills can also be used to solve everyday problem such as an creating inexpensive prosthetic limb or custom parts that are need to repair household items. However, creating a makerspace or running a maker program in a library setting is not an easy task. Libraries often lack sufficient funding to purchase various equipment for a makerspace as well as the staff who are capable of developing appropriate maker programs. This means that in order to create and operate a successful makerspace, a library must make a significant upfront investment in equipment and staff education and training. For this reason, the importance of the accurate needs-assessment and the development of programs appropriate and useful to library patrons cannot be over-empahsized. A biohackerspace requires a wet laboratory setting, where chemicals, drugs, and a variety of biological matter are tested and analyzed in liquid solutions or volatile phases. Such a laboratory requires access to water, proper plumbing and ventilation, waste disposal, and biosafety protocols. Considering these issues, it will probably take a while for any library to set up a biohackerspace. This should not dissuade libraries from being involved with biohackerspace-related activities, however. Instead of setting up a biohackerspace, libraries can invite speakers to talk about DIYbio and biohacking to raise awareness about this new area of making to library patrons. Libraries can also form a partnership with a local biohackerspace in a variety of ways. Libraries can co-host or cross-promote relevant programs at biohackerspaces and libraries to facilitate the cross-pollination of ideas. A libraries’ reading collection focused on biohacking could be greatly useful. Libraries can contribute their expertise in grant writing or donate old computing equipment to biohackerspaces. Libraries can offer their expertise in digital publishing and archiving to help biohackerspaces publish and archive their project outcome and research findings. The DIYbio movement recognized the potential risk in biohacking early on and created codes of conduct in 2011. The Ask a Biosafety Expert (ABE) service at DIY.org provides free biosafety advice from a panel of volunteer experts, along with many biosafety resources. Some biohackerspaces have an advisory board of professional scientists who review the projects that will take place at their spaces. Most biohackerspaces meet the Biosafety Level 1 criteria set out by the Centers for Disease Control and Prevention (CDC). While the DIYbio movement and biohackerspaces are still in the early stage of development, they hold great potential to drive future innovation in biotechnology and life sciences. The DIYbio movement and biohackerspaces try to transform ordinary people into citizen scientists, empower them to come up with solutions to everyday problems, and encourage them to share those solutions with one another. Not long ago, we had mainframe computers that were only accessible to a small number of professional computer scientists locked up at academic or corporate labs. Now personal computers are ubiquitous, and many professional and amateur programmers know how to write code to make a personal computer do the things they would like it to do. Until recently, manufacturing was only possible on a large scale through factories. Many makerspaces that started in recent years, however, have made it possible for the public to create a model on a computer and 3D print a physical object based on that model at a much lower cost and on a much smaller scale. It remains to be seen if the DIYbio movement and biohackerspaces will bring similar change to biotechnology.